I had to learn all these things by mere chance and through trial and error…. Observe yourself. That’s why I said earlier that self-observation is such a delightful and extraordinary thing. After a while you don’t have to make any effort, because, as illusions begin to crumble, you begin to know things that cannot be described. It’s called happiness. Everything changes and you become addicted to awareness. There’s the story of the disciple who went to the master and said, “Could you give me a word of wisdom? Could you tell me something that would guide me through my days?” It was the master’s day of silence, so he picked up a pad. It said, “Awareness.” When the disciple saw it, he said, “This is too brief. Can you expand on it a bit?” So the master took back the pad and wrote, “Awareness, awareness, awareness.” The disciple said, “Yes, but what does it mean?” The master took back the pad and wrote, “Awareness, awareness, awareness means — awareness.”That’s what it is to watch yourself. No one can show you how to do it, because he would be giving you a technique, he would be programming you. But watch yourself. When you talk to someone, are you aware of it or are you simply identifying with it? When you got angry with somebody, were you aware that you were angry or were you simply identifying with your anger? Later, when you had the time, did you study your experience and attempt to understand it? Where did it come from? What brought it on? I don’t know of any other way to awareness. You only change what you understand. What you do not understand and are not aware of, you repress. You don’t change. But when you understand it, it changes. Mohandas K. Gandhi, called Mahatma (“great soul”), was the father of modern India, but his influence has spread well beyond the subcontinent, and is as important today as it was in the first part of the twentieth century, and during this nation’s own civil rights movement. Taken from Gandhi’s writings throughout his life. 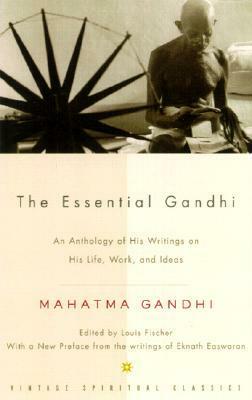 The Essential Gandhi introduces us to his thoughts on politics, spirituality, poverty, suffering, love, non-violence, civil disobedience, and his own life. The pieces collected here, with explanatory head-notes by Gandhi biographer Louis Fischer, offer the clearest, most thorough portrait of one of the greatest spiritual leaders the world has known.With a new Preface drawn from the writings of Eknath EaswaranIn the annals of spirituality certain books stand out both for their historical importance and for their continued relevance. The Vintage Spiritual Classics series offers the greatest of these works in authoritative new editions, with specially commissioned essays by noted contemporary commentators. Filled with eloquence and fresh insight, encouragement and solace, Vintage Spiritual Classics are incomparable resources for all readers, who seek a more substantive understanding of mankind’s relation to the divine. A man of few words will rarely be thoughtless…..